12/31/08 - The January 2006 issue of Coil Line is now online in the 'Reference' section. 12/20/08 - The January, 2009 issue of Coil Line, the first by our new editor, Ronald Blanks, has been posted. Members who elected the electronic version should have already received the URL. 12/19/08 - The January, 2009 issue of Coil Line, both bulk and first class, went in the mail today. 12/18/08 - Donna Rajotte in Providence reports that she has plate V2222 on the 24/7 Flag coil of 100. The plate numbers are every 20 stamps and a strip of 20 will give you a PS9.� Donna reports that these seem to be V/P, and she can�t see any other difference from the original.� USPS item number-785900. All of the affected data files have been updated. 12/18/08 - Ron Blanks wrote to say that he received his Spring edition of the USA Philatelic Catalog, which contains, on page 31, a "NEW" Water Activated Patriotic Banner Presorted STD (10c) stamp to be issued 2/24/09 at Washington DC 20066. The printer will be Sennett Security Products, with a plate number every 31 stamps. Options listed have a "Strip of 25 w/plate no. (500 coil) at $2.50. "� Use order number "787430". 12/12/08 - John Bodley caught a tagging note that did not get changed on the 41� Flag 10k coil. 11/30/08 - The December 2005 issue of Coil Line is now online in the 'Reference' section. 11/29/08 - A new plate combination, V2222, has surfaced on the 24/7 Flag coil. From the die cuts, it appears to be from a large coil of 3000 or 10,000 and an Avery Dennison product. See the enlargement of the stamp on the right. All affected data pages and charts have been updated. The above scan, cropped from the full scan was supplied by Jack T., who graciously shared his find with our readers. 11/25/08 - The December issue of Coil Line, both bulk and first class, is going in the mail today. 11/20/08 - Because of problems that I'm having with the web site server, the December 2008 issue of Coil Line will be emailed to those members who elected the electronic version. We may send the URL the normal way if we can get the problem solved. 11/15/08 - Scott # 3770a has been added to the data page for a Tagged error on the (10�) Atlas with plate V21211. 11/14/08 - Several definitions have been added to the online Glossary. The following have been added: Broken Double Die Cut; Combo Perfs; and Miscut. In addition, some cross-reference links have been added. 11/8/08 - The Sea Coast comparison page has been updated with the (5�) Sea Coast Reprint. This is the latest Sea Coast, which has microprinting. Thanks to Chris Landa for calling this to my attention. We are in the process of a server upgrade and will not be able to update the booklet site for at least another week. 11/7/08 - The results for Auction #39 have been posted. 11/1/08 - The November 2005 issue of Coil Line is now online in the 'Reference' section. 10/30/08 - Brian Engler, Sr. reports that he has seen the (5�) Sea Coast reprint with Bottom back numbers. UPDATE! John Himes adds that he received coils with Middle back numbers from Kansas City. The data page has been updated. 10/28/08 - Rob Washburn advises that his next PNC Covers pricelist will be available on 10/31 and that if anyone wants a copy, please send him a 59ct SASE at Rob Washburn, PO Box 840, Skowhegan, ME 04976. 10/27/08 - The November issue of Coil Line, both bulk and first class, went in the mail today. 10/18/08 - The November 2008 issue of Coil Line has been posted. Members who elected the electronic version will receive the URL soon. We are seeking a new editor beginning with the January, 2009 issue of Coil Line. We will start putting the January issue together around November 25th. Please contact me at ron.maifeld@pnc3.org for details if you are interested in this paid position. 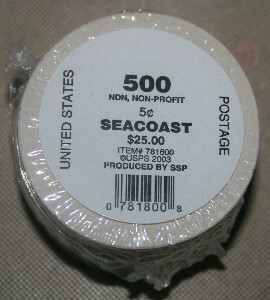 10/6/08 - Scott Publishing Company today assigned catalog number 4348 to the (5�) Lithographed Sea Coast coil with microprinting. 10/4/08 - As a result of the 'Tagging Summit' held in Hartford, Connecticut, during the APS StampShow with myself (Ron Maifeld), Richard Nazar, Alan Thomson, Gene Trinks, Wayne Youngblood and Todd Uebele, Sr., PNC3 is embarking on a campaign to define accepted terms for tagging types. Part of the program is to, and will be to alert collectors, dealers and publishers to the correct terminology concerning tagged stamps, covering the complete range of coils, booklets and sheet stamps. There were articles in both the September and October issues of Coil Line addressing this issue. All future publications of PNC3 will use the revised terminology. This web site will receive a complete make-over with the goal in mind to distinguish between Embedded Phosphor Paper, which produces 'Mottled Tagging' and Surface Phosphor Paper, which produces 'Smooth' and/or 'Uneven' Tagging. The wording 'Uneven Tagging' was chosen to replace the erroneous use of Mottled Tagging, which was being applied to Surface Phosphor Paper. ▪ Revised Glossary entries have been made for the following; Embedded Phosphor Paper, Mottled Tagging, Overall Tagging, Prephosphored Paper, Surface Phosphor Paper and Tagging. ▪ New Glossary entries have been added for Smooth Tagging and Uneven Tagging. ▪ Except where a stamp is actually Mottled, the description has been changed to Uneven. ▪ Any description that referred to Solid Tagging has been changed to Smooth Tagging. ▪ Data pages will refer to Type I paper as Embedded Phosphor and Type II paper as Prephosphored, Surface Coated. Tagging will be referred to as Mottled, Smooth or Uneven. ▪ Many of the entries on the checklists have been updated. Please bear with us as we move forward on this project. 10/1/08 - Auction Director Joe Sedivy has the lots for PNC3 Auction #39 posted. The auction ends October 20 and you must be a member to bid. Click the following link for an 'Adobe Acrobat' file listing the auction lots. Click here for the electronic bidding form or here for a printable bid form that you can mail in. Go to the 'Membership' tab for this or past auctions and/or to join the club. Joe asks that you please include your email on your bids. 9/30/08 - The October 2005 issue of Coil Line is now online in the 'Reference' section. 9/29/08 - The October issue of Coil Line, both bulk and first class, went in the mail today. This is later than planned because of a few production problems associated with the new format, which we hope that you will like when you see it. 9/28/08 - Frank Covey noticed an error on the 10� American Clock reprint coil data page. The "USPS" microprinting forms the middle I of the roman numeral VIII. 9/23/08 - The American Philatelic Society Board of Directors met today at the American Philatelic Center in Bellefonte, PA, and elected PNC3 member Wade Saadi as the new APS President. Wade replaces Nicholas Carter who died recently. 9/18/08 - The October 2008 issue of Coil Line has been posted. Members who elected the electronic version will receive the URL soon. This issue contains the listing of lots for auction number 39, and a membership renewal form. 9/12/08 - Bob Derkits reports that he received strips of 25 of the (5�) Sea Coast reprint from Kansas City that "do not have all the �dirt� that seems to be on the roll posted on Sept. 8. White paper is white and image is solid�no dots in water, trees, or sky." PNC3 Note: There will also be an unnumbered listing for a plate number strip of 11, with the plate number centered. 9/8/08 - I received a roll of the nondenominated water activated (5�) Sea Coast reprint today from Kansas City and additional data has been posted. There are 3 digit pink back numbers every 10 stamps and there is a microprinted "USPS" on the tip of the rock outcrop on the left, middle of the stamp. The date in the lower left hand margin is 2008.The roll that I received has top back numbers and all positions are possible, including # on #. The plate numbers are at 31 stamp intervals. There is an unprinted area between the two stamps to the left of the plate numbered stamp. The item number printed on the coil label is 781800, the same as the number on the 2003 water activated coil. The order number for a full coil is 701800. 9/4/08 - Tentative technical details for the Nondenominated (5�) Sea Coast reprint which goes on sale September 5th in Washington, DC have been posted. 9/3/08 - Donna Rajotte in Providence reports: Now available in Providence: 42� Flags of Our Nation, Set #2, PSA coil of 50, plate number S111111111 every 10 stamps (on the District of Columbia stamp).� A strip of 10 will give you a plate number somewhere RANDOMLY located on the strip, usually on the first stamp.� A strip of 20 will give you a plate strip of 11.� If you need the Flags in a particular order, you will have to get 20 to be assured of that order. These can be broken only in multiples of 10.� USPS item number 786600. 8/31/08 - The September 2005 issue of Coil Line is now online in the 'Reference' section. Data on the 10� American Clock reprint coil has been updated. The "USPS" microprinting is between the "III" of the roman numeral "VIII" and the perforation gauge is 9.85. 8/28/08 - Renate Fearonce in Tucson reports that she has the 42� Flags of Our Nation, Set #2 in stock. 8/26/08 - The September issue of Coil Line, both bulk rate and first class, went in the mail yesterday. 8/24/08 - A die cut missing pair of the 26� Florida Panther was given away as a door prize at the Annual Membership Meeting in Hartford. The stamps were donated by Dave Cobb of Newport Harbor Stamp Co. This pair was from a reported find of 14 rolls with the die cutting missing. 8/23/08 - The September 2008 issue of Coil Line has been posted. Members who elected the electronic version will receive the URL soon. 8/21/08 - Two PNC exhibits won Gold medals at the APS StampShow in Hartford. Bill McMurray, a PNC3 member, won the gold for his exhibit, "Tomorrow's Classics (U.S. Flags and Transportation Coil Issues of 1981)". Additionally Bill won the "PNC3 Certificate of Achievement Award" for the exhibit. Robert (Rob) Washburn, also a PNC3 member, won the gold for his exhibit, "Usages of U.S. Coils Issued in the 1980s". Rob also garnered the APS "Post 1980 Medal of Excellence" and the "PNC3 Presidents Award" for the exhibit. Congratulations to both Bill and Rob. Bruce Menia, Director at large of the American Society of Philatelic Pages and Panels (ASPPP), and a PNC3 Life Member, will be giving a program on what he calls 'breaking new ground as far as collecting Back Numbers on Souvenir Pages." The program, "Collecting Back Numbers on Souvenir Pages", will be presented at Americover 2008 this coming Saturday, August 23rd at 10 a.m. at the Marriott Hotel (Fairview Park, VA). 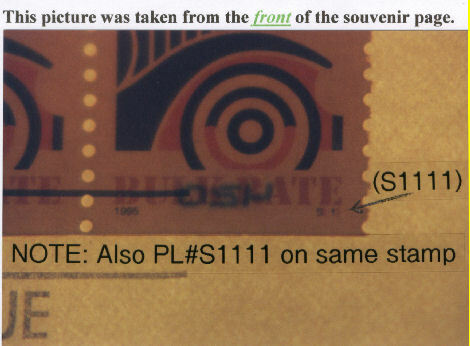 In the photo that Bruce sent, he shows that he is able to photograph back numbers on coils that are on souvenir pages. Two representatives from the USPS (Jean Schlademan & Cindy Tackett) will be there to discuss the souvenir page program and talk about what we can collect.� The scan to the right shows a number on number (# on #) stamp. 8/11/08 - Scott Publishing Company today assigned catalog number 3763 to the 2008 reprint of the 10� American Clock coil. 8/9/08 - Next Saturday, August 16, is the date of our Annual Meeting, which will be held at the APS StampShow in Hartford, CT.
8/6/08 - Tentative technical data has been posted for the second set of the 42� Flags of our Nation coil of 50 to be issued September 2, 2008. 8/1/08 - I spoke with the people at Regency-Superior Auctions today. They have a full page ad on the back page of the August Coil Line, with a number of PNC lots pictured. They asked me to remind everyone that there are quite a few PNCs in the auction that will be held at the APS StampShow. I'll have a catalog at our booth, or you can pick one up at the auction. Lot 1538 - 2281h # 2 strip of 5 tagging omitted. 7/30/08 - The August 2005 issue of Coil Line is now online in the 'Reference' section. 7/26/08 - Technical details from the Postal Bulletin have been posted for the 10� American Clock reprint. The above scan was provided by Richard F. Derkits from an order he received from Stamp Fulfillment Services (SFS) in Kansas City. There is a seam line showing at 2L. Eugene Lew reports that there is also a line at 13R, similar to that on the 1� Tiffany Lamp reprint. Anthony Willson reports that his 2008 Tiffany Lamps arrived from Renate in Tuscon.� He�received top, middle, and bottom back number coils.� While slicing them up into strips of seven he�noticed the strong difference apparent between the 13th and 14th stamp mentioned on the website, but in his case the 14th stamp and many to the right had normal strong white "2008, Tiffany Lamp, and USA".� The 13th stamp and many to the left had a pea green "2008" and much diminished "Tiffany Lamp's and USA's"�,�impacted by what appears to be an over-inking of the green color.� None of this impacts the PNC strips of seven that he created, as they were similar to the 14th stamp. 7/24/08 - Brian and Cory Snippen announced that the bulk rate copies of the August Coil Line went in the mail today. The First Class copies will be in the mail Friday morning. Watch for your mail and note the new experimental format that we are using for this issue. Your comments, pro or con, would be appreciated before the board meeting at the APS StampShow on August 16th. 7/21/08 - Renate Fearonce in Tucson reports that she has the 24/7 42� American Flags coil of 100 in stock with plate P1111. 7/19/08 - Donna Rajotte in Providence reports: We do not have the 2008 reprint of the 10� American Clock coil and do not expect it any time soon. The August 2008 issue of Coil Line has been posted. Members who elected the electronic version will receive the URL soon. Members who receive their copy in the mail will receive an experimental format. We would like to know your thoughts, pro or con, on the new version. 7/18/08 - The following was received from Steve Esrati while I was without internet access: "I am closing down. Al Haake will take over my new-issues service and my newsletter will go out of existence. My wife had to call 9-1-1 in May because she found me on the floor in the den. The EMS guys took me to the emergency room, which shipped me off to the Cleveland Clinic with a diagnosis of congestive heart failure. This comes in addition to my diabetes and a cancer for which I have been treated since last year. I could not continue the busy schedule I had set myself. All subscribers will receive refunds." 7/17/08 - All of the affected data pages and the checklists have been updated with the Scott catalog numbers listed below. 7/6/08 - Joe Sedivy is now accepting lots for the next PNC3 auction. The deadline is August 16th to have the lots to Joe. Click here for a consignment form. Scans have been posted for the 1� Tiffany Lamp WAG coil of 3k including the seam lines mentioned below. 7/5/08 - All of the strips that I have seen so far of the 1� Tiffany Lamp WAG coil of 3k have a black vertical line between the stamps immediately to the right of the plate numbered stamp, plus a light colored vertical line on the right side of the 13th stamp to the right of the plate numbered stamp. 7/1/08 - Renate Fearonce in Tucson reports that she has received the 1� Tiffany coil. I have bottom, middle and top back numbers. No full coil orders, as I only have one coil of each and that�s it for me. 6/30/08 - The July 2005 issue of Coil Line is now online in the 'Reference' section. 6/26/08 - Frank Covey reports that the 1� Tiffany Lamp WAG coil of 3k has back numbers in all three positions, top, middle and bottom. Frank also notes that the wrapper label is the same as the label used for the original printing. 6/21/08 - The Postal Bulletin of 6/19/08 had announcements of two reprints. The first, to be issued July 15th, is a 10k water-activated coil of the 10� Clock stamp. This stamp will be printed by offset and have microprinting. The second, to be issued September 5th, is a water-activated coil of 500 of the nondenominated (5�) Sea Coast. 6/20/08 - Donna Rajotte in Providence reports that she has restocked the 1� Tiffany Lamp WAG coil of 3k (2008 printing). Renate Fearonce in Tucson reports that she has received the 42� Flags of our Nation coil of 50. She does not have the 1� Tiffany coil but hopefully will have it by the end of next week. Robert Rabinowitz reported the following on USSTAMPS@yahoogroups.com yesterday. News from Kansas City is that the 42� Official Mail coil of 100 scheduled for release June 20 will NOT be issued. Apparently it hasn't even been printed. Speculation is that there are plenty of 41c'ers left and they will be used up before new printings are considered. 6/19/08 - The July 2008 issue of Coil Line has been posted. Members who elected the electronic version will receive the URL soon. Each stamp will have a major number. Two strips of 5 will be given minor-letter listings. The first strip of 5 will start with the flag stamp with plate number and end with Arizona; the second strip of 5 will pick up from there and end with Delaware. There will be a lettered minor listing for the "P# set of 10 . . ." consisting of the two lettered strips of 5. Then, for the plate number purists with album pages that are two feet wide, there will be the traditional unlettered listing for a P# strip of 11 with the plate number in the center position. A footnote will explain that the plate number appears on each (American) flag stamp, and that a plate # strip of 10 may be collected connected consisting of each of the two minor-lettered strips of 5, but that such a strip will not fit into standard albums. 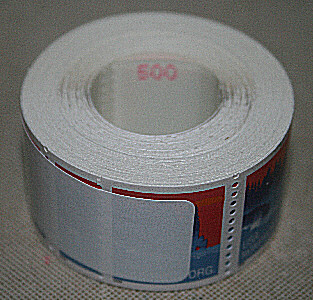 It is our belief that extremely few collectors will collect this item as a strip of 10 (or 11). For that reason, we have fashioned the listings to coincide with the way we feel almost all collectors will want to collect these stamps. This treatment will carry through to all the upcoming flag coils, also. The listings and footnote do allow collectors to collect this set in any of the three logical configurations: two strips of 5, a strip of 10, or a traditional strip of 11. 6/17/08 - Jim LaPlante caught an error on the data page for the 10� Clock water-activated coil issued in 2006. The stamps are untagged but printed with luminescent yellow ink for the Eagle and the denomination. 6/16/08 - Technical data has been updated for the 42� Flags of our Nation coil of 50. A scan of the plate numbered stamp has also been posted. 6/14/08 - The description on the data page for the 27� Tropical Fruit strip of eleven, not nine, has been corrected. I ran out of fingers. Thanks to Chris Cripps for catching this. 6/13/08 - Donna Rajotte in Providence reports that she now has the 42� Flags of Our Nation PSA coil of 50, plate number S111111111 every 10 stamps (on the Stars & Stripes stamp).� A strip of 10 will give you a plate number somewhere RANDOMLY located on the strip.� A strip of 20 will give you a plate strip of 11.� If you need the Flags in a particular order, you will have to get 20 to be assured of that order.� USPS item number 786500.� Sale date 6/14/08 (orders will be shipped on Monday). 6/11/08 - Scans have been posted for the 27� Tropical Fruit coil of 100. 6/9/08 - This just in from Steve Esrati: "I talked to Al Haake last night. We're sending them (the 42� Flags of our Nation) out in alphabetical order with no regard for the plate number. No strips with the plate number on the middle stamps." Mike Lipson reports that: "The newly issued 2008 1� Tiffany coil has a very weak seam line 1R through the perforation. There is also a� very vivid�seam line not on the PS5.� It is located on the scrap piece between the 11th and 12th stamp counting from the left which makes it 13R." 6/6/08 - Thanks to Mary Jo Foster for catching a few broken links on the "G" stamps comparison page. 6/5/08 - Donna Rajotte in Providence reports that she now has the 1� Tiffany Lamp WAG coil of 3k (2008 printing), plate number every 31 stamps, pink 4 digit top and bottom back numbers every 10 stamps. 310 stamps for all positions. USPS item number-781500. (Sale date June 7, 2008) Donna mentions that the plate number frequency is every 31 stamps. 6/4/08 - Tentative technical data has been posted for the 42� Flags of our Nation coil of 50 to be issued June 14, 2008. The checklists have also been updated. Rob Washburn wrote: Regarding the 6/2 Linn's discovery of a tagged unnumbered Atlas coil, I looked through my covers and found one with the same tagging. It is a plate # V21211 single on cover from an unknown mailer with a Kent, Ohio return address. Jeff Fiszbein reports that: I found one V333333 that appears to be printed on different paper than the others. While not tagged, it appears to on hi-brite paper, and doesn't have that bluish tint when viewed under LW. 6/2/08 - Technical data has been posted for the 1� Tiffany Lamp coil reprint to be issued June 7, 2008. The checklists have also been updated. 6/1/08 - The June 2005 issue of Coil Line is now online in the 'Reference' section. 5/22/08 - The June 2008 issue of Coil Line was entered into the mail stream today. 5/20/08 - The June 2008 issue of Coil Line has been posted. Members who elected the electronic version will receive the URL soon. There will be an election ballot with this issue. 5/16/08 - Brian Snippen found a couple of typos on the checklists which have been corrected. 5/15/08 - All of the links for the 24/7 Flags and the Tropical Fruits are now working, and the checklists and data pages have been updated with the Scott numbers listed below. 4232 42c Flag at Dusk, self-adhesive Ashton-Potter-printed coil stamp, serpentine die cut 9� vert. 4233 42c Flag at Night, self-adhesive Ashton-Potter-printed coil stamp, serpentine die cut 9� vert. 4234 42c Flag at Dawn, self-adhesive Ashton-Potter-printed coil stamp, serpentine die cut 9� vert. 4235 42c Flag at Midday, self-adhesive Ashton-Potter-printed coil stamp, serpentine die cut 9� vert. 4258 27c Tropical Fruit coil stamp, Papaya, serpentine die cut 8� vert. 4259 27c Tropical Fruit coil stamp, Guava, serpentine die cut 8� vert. 4260 27c Tropical Fruit coil stamp, Pomegranate, serpentine die cut 8� vert. 4261 27c Tropical Fruit coil stamp, Star fruit, serpentine die cut 8� vert. 4262 27c Tropical Fruit coil stamp, Kiwi, serpentine die cut 8� vert. 5/2/08 - Tentative data has been posted for the 27� Tropical Fruit coil of 100. 4/30/08 - The May 2005 issue of Coil Line is now online in the 'Reference' section. 4/29/08 - Donna Rajotte in Providence reports that she now has the 27� Tropical Fruit, PSA coil of 100. V1111111 every 40 stamps (this will give you a PS11).� They seem to be V/P.� USPS item number-786300. 4/25/08 - Renate Fearonce in Tucson reports that she has received the 27� Tropical Fruit coil of 100 which goes on sale today. The May 2008 issue of Coil Line is going into the mail stream today. 4/24/08 - Don't forget that there will be a Regional Meeting at the Plymouth, Michigan stamp show. The meeting is at 11 AM on Saturday morning, April 26th, at the Plymouth Middle School. 4/22/08 - Scans have been posted of all the 24/7 42� American Flags. Use the links below. 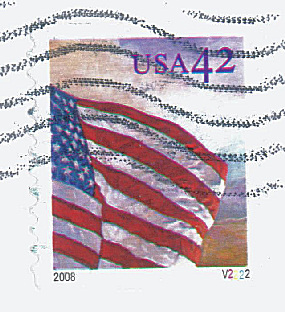 4/21/08 - The new summer 2008 'USA Philatelic' catalog arrived today and notes that the 'Flags of Our Nation' coil of 50 will have plate numbers every 10 stamps. Examples of all the new 24/7 42� American Flags are in. All of the coils of 100 from all three printers have the plate number on the 'Sunrise' stamp, and the tagging is solid (smooth), with the first stamp on the coil being the 'Morning Sunrise' stamp. On the Avery Dennison coil of 100, plate V1111 is placed every 20 stamps. Peak/Valley die cuts have been reported, and I have Valley/Peak. On some Avery rolls a dramatic die cut shift takes place between the left side of the coil and the right side. Shown below is a bell top on the left that turns to a VP on the right in the same plate strip of 9. The Ashton Potter coil of 100, with P1111 every 16 stamps, has Valley/Peak die cuts, which is probably the only way these will come. The Sennett Security coil of 100, S1111, that I have is Peak/Valley. The plate number interval is every 16 stamps. It appears that it has been issued in a 'stick of 10' format. As reported earlier by Donna Rajotte, the plate number interval on the Sennett Security water-activated coil of 3,000 alternates between 12 and 16 stamps on the same coil. The tagging is solid (smooth), and the plate number is S1111111. Back numbers are 4 digit pink, top and bottom. The Avery Dennison coils of 3,000 and 10,000 have plate number V1111 at eight stamp intervals. These larger coils are on a liner paper that is higher than the stamps with spacing in-between the stamps, which have rounded corners. The tagging is also solid (smooth). The back numbers on both size coils are 5 digit blue, centered in the middle of the liner. 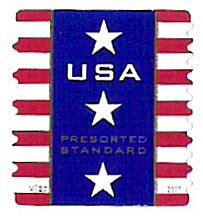 Coil stamps planned by the U.S. Postal Service in the next several months include the 1� Tiffany Lamp coil of 3,000 on June 7th, the Flags of our Nation coil of 50 on June 14th which may or may not have a plate number, an Official mail coil of 100 on June 20th and a 10k coil of the 10� Clock on July 15th. More details as they are available. 4/19/08 - The May 2008 issue of Coil Line has been posted. Members who elected the electronic version will receive the URL soon. ▪ .42 Flags 24/7 PSA coil of 100, plate number P1111 every 16 stamps - this will give you a PS9. USPS item number-785900. ▪ .42 Flags 24/7 PSA coil of 100, plate number V1111 every 20 stamps - this will give you a PS9. USPS item number-785900. ▪ .42 Flags 24/7 PSA coil of 100, plate number S1111 every 16 stamps - this will give you a PS9. USPS item number-785900. ▪ .42 Flags 24/7 WAG coil of 3K, plate number S1111111. The interval varies: one strip is 12, the next is 16, followed by another 12, etc. - this will give you a PS9, pink 4 digit top and bottom back number every 10 stamps. Odd coils only. Positions 2 and 4 recur randomly, but always within 100 stamps. USPS item number-786800. ▪ .42 Flags 24/7 PSA coil of 3K, plate number V1111 every 8 stamps - it will take 12 stamps for a PS9, blue 5 digit middle back number every 10 stamps. Odd coils. Positions 2 and 4 every 40 stamps. USPS item number-786000. ▪ .42 Flags 24/7 PSA coil of 10K, plate number V1111 every 8 stamps - it will take 12 stamps for a PS9, blue 5 digit middle back number every 10 stamps. Odd coils. Positions 2 and 4 ONLY, every 40 stamps USPS item number-786100. These seem exactly the same as the stamps from the 3K rolls. ▪ .42 24/7 Flag (16) - PSA coil of 100, S1111, no back numbers, 4 different designs, smooth tagging, so far I see peak at the top but we can see what you all think later. ▪ .42 24/7 Flag (8) - PSA 10K, V1111, aqua 5 digit middle numbers every 10 stamps, 16 stamps to get a PNC9, #/# every 40 stamps. ▪ .42 24/7 Flag (8) - PSA 3K, same information as the 10K. They seem to be identical other than coil size. ▪ .42 24/7 Flag (12) - WAG 3K, pink top and bottom 4 digit back numbers, positions 2/4 or 1L and 1R, does not have #/#. On the Avery Dennison coil of 100, I've had reports that each coil begins with the 'Sunrise Flag' stamp. The 'Sunrise' stamp also has the plate number. Peak/Valley die cuts have been reported so far. The Ashton Potter coil of 100 also has the plate number on the 'Sunrise' stamp. I have seen Valley/Peak die cuts, which is probably the only way these will come. The tagging is smooth. The Sennett Security coil of 100 that I've seen has a Peak/Valley die cut and the tagging is smooth. The plate number is on the 'Sunrise' stamp. 4/17/08 - The data on the 37� Snowy Egret page has been changed to show that the printing was done by the offset method on the Muller Martini press. Thanks to Ron Archer for bringing this to our attention. 4/13/08 - The results of our PNC3 auction #38 which ended March 22, 2008 are now posted online. All the auction information can be accessed by using the 'Membership' button, or by clicking here for the auction results. Thanks to Auctioneer Joe Sedivy for another successful auction. 4/11/08 - Three new polls have been added on our message board, asking how you plan to collect the upcoming multiple-design issues. Poll ends in thirty days. 4/9/08 - Several definitions relating to paper and tagging have been updated in the Glossary, which is accessible from the 'Reference' tab on the left. Changes include Block Tagging, Embedded Phosphor Paper, Mottled Tagging, Prephosphored Paper, Solid Tagging and Surface Phosphor Paper. There will be an article on these items in the May 2008 Coil Line. in addition, a new definition, Die Cut Row Separator, has been added to describe the section of the die cut that normally would be between two rows on properly sliced coils. 4/2/08 - Teresa Wajeck of PNCs Unlimited has been added to the dealer list which can be found by clicking on the 'Collecting PNCs' navigation bar on the left. Her web site is www.pncsunlimited.com. 3/31/08 - The April 2005 issue of Coil Line is now online in the 'Reference' section. 3/25/08 - The April 2008 issue of Coil Line went in the mail today. 3/19/08 - Donna Rajotte in Providence reports that she now has the (10�) Avery Dennison PSA Patriotic Banner stamps with plate number V222 every 10 stamps and aqua 5 digit low middle back numbers every 10 stamps. Donna also says that the "Back number is on the same stamp as the plate number (position 3) every 10 stamps.� USPS item number-784700. Besides being a different plate number, the tagging seems to be different on this printing.� The original was dead under both SW and LW ultraviolet light, but on this printing, the stamps glow brightly (especially the white stars and stripes) under both lights." I think what Donna is probably seeing is the high-bright paper showing through which makes it looked tagged. This issue should not be tagged. 3/18/08 - The April 2008 issue of Coil Line has been posted. Members who elected the electronic version will receive the URL soon. 3/16/08 - Tentative data has been posted for the 42� Flags 24/7 coil stamps to be issued April 18. Included are self-adhesive coils of 100 from Ashton Potter, Avery Dennison and Sennett Security Products. Data for the large self-adhesive coils of 3,000 and 10,000 from Avery Dennison and the Sennett water-activated coils of 3,000 is also posted. 3/15/08 - A file has been posted with the new postage rates effective May 12th. Access the data by using the 'USPS Rates & Info' tab on the left, or by clicking the above link. 3/14/08 - Dan Farrar, the PNC3 Secretary, is the first to report a new plate number, V222, on the Avery Dennison (10�) non-denominated Patriotic Banner stamp. Click on the cover scan to see a larger view. Pressure-sensitive adhesive (PSA) coil of 100 (Item 785900). PSA coil of 3,000 (Item 786000). PSA coil of 10,000 (Item 786100). Water-activated gum (WAG) coil of 3,000 (Item 786800). Three different printers, Ashton Potter (AP), Avery Dennison (AVR) and Banknote Corporation of America/Sennett Security Products (SSP), will produce self-adhesive coils of 100. Avery Dennison will produce self-adhesive coils of 3,000 and 10,000. Sennett Security Products will produce water-activated coils of 3,000. 3/10/08 - Frank Covey wrote to say that - Half of the 2008 Values Lists went in the mail on Saturday. If a Values List was the only item ordered, it went out as First Class mail. If other items on the January 2008 order form were shipped then the package was sent as "bound printed matter". The remainder of the shipments will go out in this mornings mail. 3/8/08 - Our server was down last night and most of this morning. Sorry for any inconvenience. 3/2/08 - Auction Director Joe Sedivy advises that there are two errors in the current auction listing. Item #66 should be plate 18 and items 202-204 are PS5 strips. Both have been fixed in the online listings. 3/1/08 - The March 2008 issue of Coil Line went in the mail today by First Class and yesterday by bulk-mail. 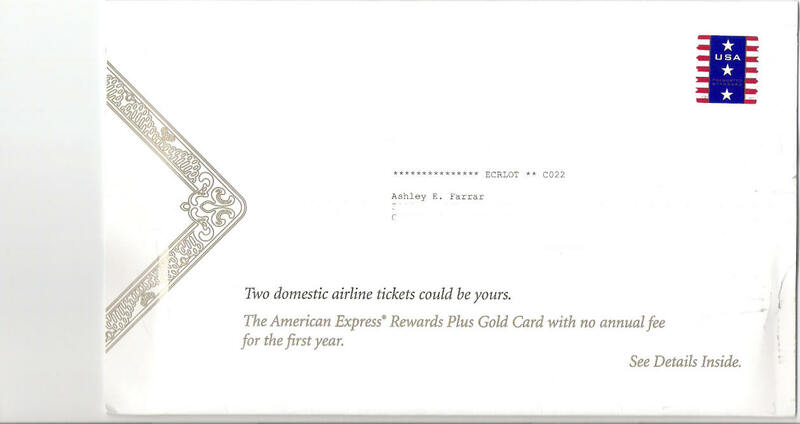 Members desiring to upgrade to First Class can take advantage of a special offer of $3.00 for the balance of the year. Send your check to the PNC3 Treasurer indicating that you wish to upgrade to the First Class mailing. Details will be in the April Coil Line. 2/29/08 - The March 2005 issue of Coil Line is now online in the 'Reference' section. 2/27/08 - Auction Director Joe Sedivy has the lots for PNC3 Auction #38 posted. The auction ends March 22 and you must be a member to bid. Click the following link for an 'Adobe Acrobat PDF' file listing the auction lots. Click here for the electronic bidding form or here for a printable bid form that you can mail in. Go to the 'Membership' tab for this or past auctions and/or to join the club. Joe asks that you please include your email on your bids. 2/23/08 - The March 2008 issue of Coil Line has been posted on the web site. Those who receive the electronic version will receive an email with the URL. Note that the announcement from Frank Covey will contain a new password. 2/19/08 - Rob Washburn announces that his latest pnc cover pricelist will be available on Feb 27. It is by far his largest offering ever and includes covers for beginners to advanced collectors as well as some mint pnc strips and other oddball items. Anyone wanting the pricelist should send a 58 cent SASE to Rob Washburn, P.O. Box 840, Skowhegan, ME 04976. 2/16/08 - Don Mackintosh caught an error on the 29� Mt. Rushmore data page. The tagging was listed as solid, when instead it should be mottled. 2/11/08 - The U. S. Postal Service announced today that rates will be going up May 12. Effective on that date, First Class Mail will increase by One Cent. The first ounce will go to 42� and the postcard rate will be 27�. The second ounce rate will stay at 17�. 2/9/08 - Michael Mules sent in another scan of plate V22222 on the Avery Dennison 41� Flag coil of 100. This time it was to confirm the existence of the Peak/Valley die cut variety. 2/7/08 - Renate Fearonce in Tucson sent another email today stating that she has the Avery Dennison 41� Flag PSA coil of 100, with plate number V22222 every 11 stamps. She notes that - so far I see V/P and I don't remember if this came both ways. In a quick comparison between V11111 and V22222 they look similar. Tagging on the V22222 is different as the V11111 had a dead appearance and on the V22222 the white stripes glow green under short wave. 2/6/08 - Donald Mackintosh sent a copy of the 17� Electric Auto (Scott # 1906a) with a type "D", 14.1mm precancel. The stamp has been scanned and the data page updated. After clicking on the above link, scroll to the "Notes" near the bottom of the page. 2/5/08 - Renate Fearonce in Tucson sent an email yesterday stating that she is still taking orders. She has the 41� Beautiful Blooms PSA coil of 100, with plate number P2222 every 30 stamps. 2/3/08 - Michael Mules reports finding plate V22222 on the Avery Dennison 41� Flag coil of 100. See the scan below. 1/31/08 - The February 2005 issue of Coil Line is now online in the 'Reference' section. The February 2008 issue of Coil Line went in the mail today. A New Plate Number? The pictures on the right were scanned from a stamp submitted by Jim Ellis of Greenwood, S.C. at the APS AmeriStamp Expo 2008 in Charlotte, N.C. What appears at first glance to be plate number A5559, is actually a plate A5555. The very right edge of the cancellation hits just right to fill in the open area of the 5 to make it look like a 9. It's hard to see in the scan, but there is a slight difference in the darkness of the black ink of the 5 and that of the cancel. 1/26/08 - The February 2008 issue of Coil Line has been posted on the web site. Those who receive the electronic version will receive an email with the URL. The printed copy will go to the printers Monday. 1/25/08 - Bob Rabinowitz reports on the US Stamps Discussion Group that he has found plate combination P2222 on the 41� Beautiful Blooms coil of 100. No further details available at this time. 1/22/08 - We received an urgent plea from Renate Fearonce in Tucson. The following is from her email. "This is my last plea for support of the Tucson Philatelic. I have been notified that I will now be only allowed 4 hours for Philatelic and the rest of my day will be in the Passport office. This is to take place Feb 2. If this comes to be I will no longer do philatelic mail orders. The biggest problem is these folks I work for have no idea what I do, and have never taken the time to come and see how I service philatelic customers. Yes, I am very upset but not surprised. I hope you all will voice your opinion once more." 1/19/08 - Late last night the PNC3 web site reached another milestone. It was a year ago today that we tallied 250,000 visits on the site and the counter yesterday edged over the three hundred thousand (300,000) mark. Thanks to everyone for your continued patronage and help. 1/18/08 - Terry Ramsey, a new PNC3 member brought the cover shown here to the PNC3 booth at the APS AmeriStamp Expo in Charlotte, North Carolina. 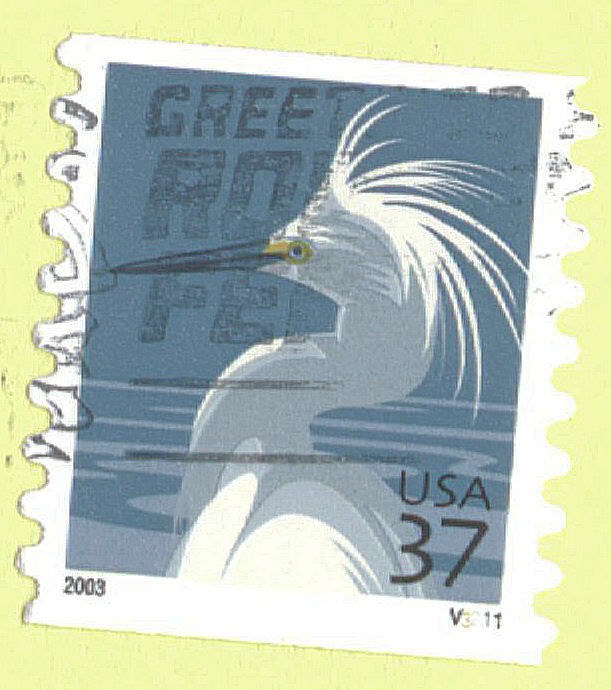 The stamp is a 37� Snowy Egret with plate V3211 and peak/valley die cuts. Terry also had a V3211 with valley/peak die cuts. These are the first covers reported with the V3211 plate combination. Click on the scans for a larger view. Click HERE for an enlarged view of the stamp. The return address has been obliterated to protect the privacy of the mailer. 1/11/08 - Steve Esrati reports: I will soon be able to supply a new tagging variety on Sennett's denominated Flag (still S1111).The tagging resembles that on Ashton Potter and Avery coils in that it is smooth. The original Sennetts were uneven. In addition, the original Sennetts were uneven in long-wave UV. These are dead. 1/10/08 - Only one day remaining before the APS winter show in Charlotte, NC. I'll be there in the PNC3 booth and the regional meeting on Saturday. I hope to meet many of our members from that part of the country. I'm not sure what kind of, if any, internet access I'll have. 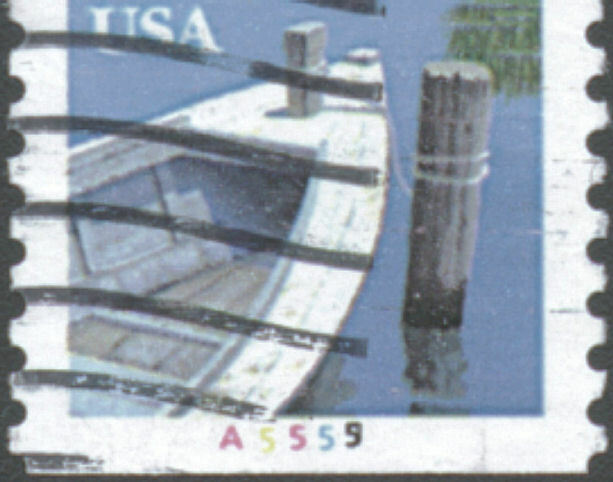 1/9/08 - Donna Rajotte in Providence reports that she now has the (5�) Sea Coast PSA coil of 10k, plate number P9999 every 27 stamps, with black top and bottom back numbers every 10 stamps, 270 stamps for all positions.� USPS item number-781400.
. What do others think? Replies can be posted on the PNC3 message board, which can be accessed from the 'Membership' tab on the left. Go there also to see the previous discussion on this subject. 1/3/08 - The January 2008 issue of Coil Line went in the mail yesterday, January 2nd. 1/1/08 - HAPPY NEW YEAR ! The January 2005 issue of Coil Line is now online in the 'Reference' section.